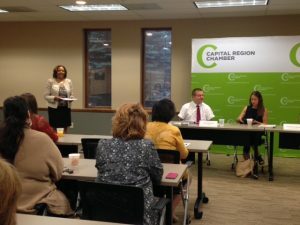 A Chamber forum entitled Employ-Abilities For All Skill Levels, which featured three Capital Region business leaders who shared resources about expanding one’s current candidate pool to include qualified applicants with disabilities. Studies show organizations that embrace a diverse and inclusive approach experience greater economic growth and maintain a competitive advantage. When diversity and inclusivity exists throughout a region, it drives innovation and productivity, attracts new talent, enhances business opportunity and becomes fertile ground for cultural richness and technological advances. The Capital Region Chamber is committed to supporting the region in expanding its commitment to diversity, equity and inclusion. The Capital Region Chamber values evolving demographic changes in our region and appreciates its potential. As an advocate for the regional business community, the Chamber – through its leadership, educational programming and community collaboration – is committed to diversity, equity and inclusion. By engaging individuals reflective of the full spectrum of our region, businesses advance innovation and productivity and gain competitive advantage. For more information on the Chamber’s Diversity, Equity and Inclusion initiatives and programs, contact Angela Dixon, Vice President, Talent & Inclusion at 518.431.1415.